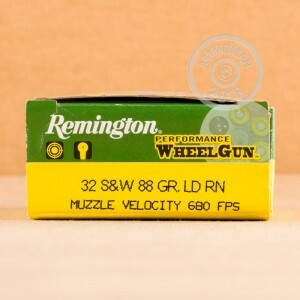 These target loads from Remington's Performance WheelGun line are a great choice for practice and plinking with your .32 S&W revolver. Each cartridge is manufactured using a brass casing that can be deprimed, tumbled clean, and then reloaded at your home bench. Remington fixes their own Kleanbore primer to the base of each casing for reliable ignition. Kleanbore primers contain zero corrosive salts or mercury so that your bore and breach are never in danger of premature rusting. Atop each round is an 88-grain projectile which rates right in the center of the caliber's classic weights. A muzzle velocity of 680 feet per second spells out controllable recoil for relaxing range fun. The projectile is of a Lead Round Nose (LRN) design which inserts easily into cylinders for smooth single-loading or speedloader use. A slightly pronounced shank ensures that the bullet will seamlessly transition from the cylinder to the forcing cone, to the barrel with minimal wobble while taking full advantage of your revolver's rifling. This results in consistent accuracy with every shot. Remington has been around since the year 1816 and is America's only major manufacturer of both firearms and ammunition. 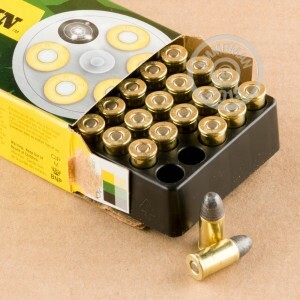 Their command over the industry allows them to present shooters with effective ammo that is also fairly priced.